Based on twin studies, we now know that 25% of autoimmunity is genetics, and the other 75% is environment. I believe there are 5 main environmental factors that contribute to autoimmunity: leaky gut, diet, stress, toxins, and infections. Every one of these is a piece of the pie–for some, one piece may be bigger–but all play a role to some degree. 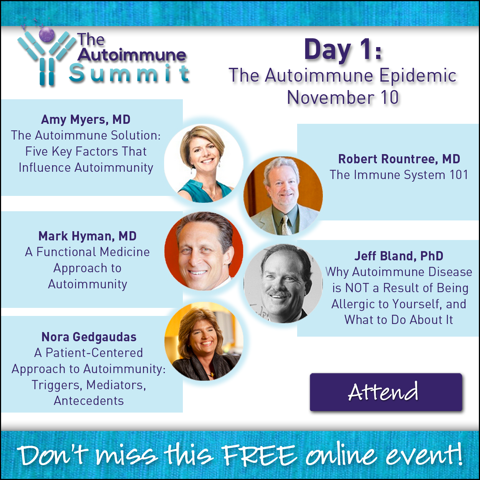 Each day of The Autoimmune Summit will include speakers from each category. In addition, certain experts will discuss special cases in autoimmunity, and why autoimmune disease has become such an epidemic. Gluten, Grains, Diets, The Gut, Toxins and Detox, Stress and Hormones, Infections and much more. Can I be honest with you? No, You can’t. Great speech on Honesty, Judgement and Denial. Channelling profound messages from Higher Consciousness and Spirit Guides. Sounds cheesy? Well, listen to Micheila Sheldan first, then judge..